Widows and sisters-in-law Bhan Mati and Krishna Kumari were good friends. They were both 68. They did things together and travelled to meet fami­lies and relatives together. Ms Ku­mari was married to Ms Mati’s late brother. Last weekend they went to Suva to visit their nephew, Anil Kumar, a carpenter, at the Colonial War Me­morial Hospital who was seriously injured after he allegedly fell from a roof. They were returning home to Saweni, Lautoka, when the vehicle they were in collided with a bus at Waimalika on the Nadi side, five kilometres from their residence. Ms Kumari died at the accident scene while Ms Mati died later at Nadi Hospital. Members of their family lamented that it was a cruel end for two peo­ple who lived life to the fullest and loved their families and their rela­tives. Daughter of Ms Kumari, Krish Kanta Wati, 45, said she was still shocked and heartbroken with the tragedy. “She was a very loving mother who always cared for her kids and her grandchildren. This is a very difficult time for me and my family. First we learned our cousin was ad­mitted at the CWM Hospital in Suva with only 24 hours left to survive and then now we have we have lost two mums,” Ms Wati said. The two widows were in the same vehicle as Shalendra Rohit Vinod, the late Ms Kumari’s son, daughter-in-law Anita Devi and grandson Anuj Jordan. 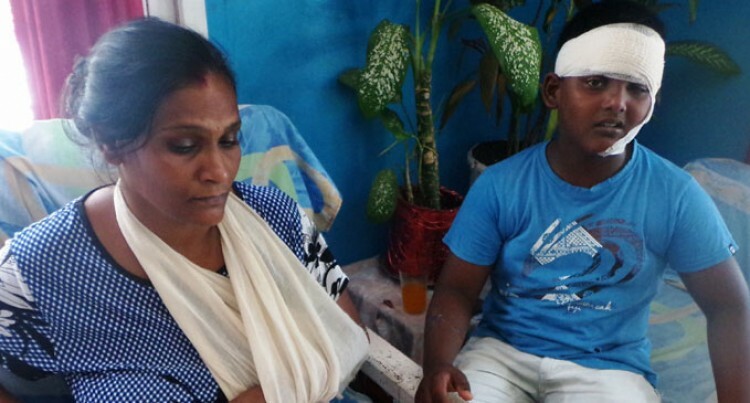 Fortunately, 11-year-old Anu, his mother Ms Devi and Mr Vinod survived, escaping with cuts and bruises. They were discharged from the Nadi Hospital yesterday. The family, were also preparing for a one-year pooja for one of their recently deceased loved ones. It was also a sixth-month pooja for the late Ms Mati’s 48-year-old son Ramend Kumar. He was kicked by a horse while working at a farm in Lautoka. Also the two widows’ nephew Mr Kumar was in critical condition. The late Ms Mati’s daughter-in-law Sarita Wati said she had lost some­one that loved her as her own from the first day they met. She and her son were supposed to pick up her mother-in-law from Saweni (Ms Kumari’s residence). Instead they were met with the tragic news. She said: “This is not only a sad day for us as a family; our friends and all of those whose lives she im­pacted either through helping or just by being friendly and caring towards them. We will all miss her dearly, but will never forget her,” Ms Wati said. “When I was told of the news I did not want to believe what I was hearing because she had just called us at 9:50pm, informing us to pick her from Saweni. But after waiting there for more than 20 minutes, that was when I realised something was wrong. “It was very painful,” she said. The late Ms Mati is survived by her son 43-year-old son Abhay Ram and four grandchildren, while Ms Kumari is survived by five children and six grandchildren.